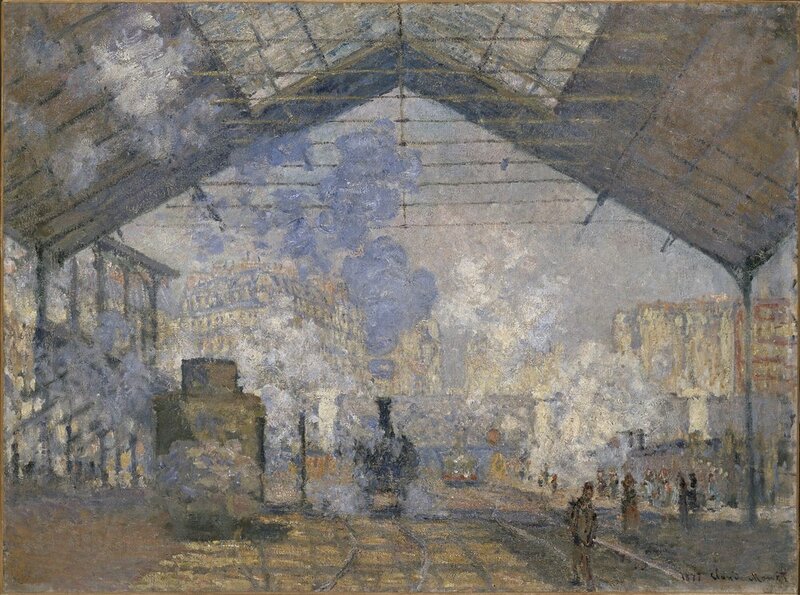 The billowing steam and smoke in Claude Monet’s Gare St Lazare, currently on loan from the Musée d’Orsay and hanging in the Louvre Abu Dhabi is almost overwhelming to the viewer. In fact, Monet was criticised at the time of painting for obscuring too much detail. However, it was the clouds of muted colour and their contrast with the grid-like roof that enticed Vikram Divecha as a child and led the aspiring artist to make sketches of the painting, which became one of his favourite pieces of art in the world. Fast forward several years and Divecha found himself working in collaboration for an artwork to be placed in the Louvre Abu Dhabi with MTX – Broderie Architecturale, a French interior design firm that works with textile and embroidery at architectural scale and whose Paris office is situated right next to the St Lazare Station. The coincidence was too much for Divecha to ignore. He knew that this commission would be based around the station. Divecha is a Dubai-based artist whose practice revolves around the idea of intervening into existing urban systems whether social, economic or industrial to generate an altered outcome that usually highlights the construction of the original system and raises fascinating and unanswered questions. Vikram Divecha and MTX - Broderie Architecturale. Train to Rouen (2017). Image courtesy of Louvre Abu Dhabi. For this project, titled Train To Rouen (2017), Divecha took Monet as a starting point. Speaking to scholars of Monet’s work he discovered that the 19th century artist had wanted to delay a train to Rouen from the St Lazare Station by half an hour as that would have given him the ultimate light and shadow conditions to create the painting he envisioned. He also discovered that during the Industrial Revolution, clock time was standardised across France. Working from these ideas, Divecha and MTX approached the French railway company and asked to delay one train to Rouen from the St Lazare Station by five minutes. They agreed and Divecha charted the effect of this delay, which he describes as a “minute ripple in the system”. The artwork takes the form of an architectural structure laced through with twisting ribbons that denote two flows of time – the real events and the theoretical ones – hence he pitted the train’s timetable against what actually happened. The overall work resembles an abstract musical score and also explores the relationship between the organic and inorganic, static and animated. Vikram Divecha and MTX - Broderie Architecturale. Train to Rouen, 2017 (detail). Image courtesy of Louvre Abu Dhabi. These kinds of dichotomies are picked up in the other three commissions which comprise the group exhibition titled Co-Lab: Contemporary Art & Savoir-faire, in one of the temporary galleries in the Louvre Abu Dhabi. Curated by Alia Zaal Lootah, the show is the result of a two-year Emirati and French collaborative programme which paired up UAE-based artists with French manufacturers to encourage new ways of thinking and to underline the inclusive outlook of the Abu Dhabi institution. Zeinab Alhashemi and Verrerie de Saint Juste-Saint Gobain. Metamorphic. Installation view as part of Co-Lab: Contemporary Art & Savoir-faire at Louvre Abu Dhabi. Pictured here with Khalid Shafar's Chromachron, 2017. Image courtesy of Louvre Abu Dhabi. Zeinab Alhashemi collaborated with Verrerie de Saint Juste-Saint Gobain, one of the leading glass work producers in Europe for her piece Metamorphic. The site-specific work is based on the changes in topography and natural environment on Saadiyat Island, the site of the Louvre Abu Dhabi and the rest of Abu Dhabi’s burgeoning cultural district. Eight layers of reinforced steel industrial mesh are suspended from the ceiling at opposing angles and within some of the framework, specialised squares of glass have been fitted. The colours of the glass, which vary with the light, are based on a satellite images of the island. The heavy material somehow seems light as it sways from its hanging and the repetitive square shapes are reminiscent of pixels, allowing the artwork to deconstruct the digitised way we look at the world. The entire piece summarises the transformation of the island into the cultural district and also points to the UAE's ever-changing landscape and skyline. The deliberate use of natural elements of glass juxtaposed with industrial material is a play between man-made and hand-made and also points to the fact that after the passing of time, these two elements can no longer be separated. “We try to control and confine nature with our development and construction but with time, these interventions go beyond the surface and become part of the environment,” Alhashemi explains. Zeinab Alhashemi and Verrerie de Saint Juste-Saint Gobain. Metamorphic (detail). Installation view as part of Co-Lab: Contemporary Art & Savoir-flair at Louvre Abu Dhabi. Image courtesy of Louvre Abu Dhabi. Through her work with the Manufacture Nationale de Sèvres, one of the principal European porcelain manufactories, Talin Hazbar explored both the ancient art of ceramics as well as the function of archaeology for her work Transient: A Brief Stay (2017). Her practice is based in decoding the found objects of an archaeological dig. Rather than being focused on the destructive elements of excavation, she is interested in the constructive elements of what can be built from preservation and restoration of ancient objects - such as knowledge and historical significance. As such, her artwork emerges upwards in column-shapes resembling one of the many sky-scrapers that define the UAE’s modern landscape and denoting a sense of possibility and development. Talin Hazbar and La Manufacture Nationale de Sèvres. Transient: A Brief Stay (2017). Installation view seen with Vikram Divecha's work on the right side in the background and Khalid Shafar's work Chromachron, 2017 made in collaboration with Mobilier National Manufactures Nationales Gobelins-Beauvais-Savonnerie hanging from the ceiling. Image courtesy of Louvre Abu Dhabi. Its structure is made from sand from three separate archaeological sites from the UAE (Mleiha, Al Ain and Dhaid), which has been used to create a kind of base material that is then embedded with pieces of incomplete ceramic objects that incorporate shades of blue and also resemble natural geographic objects such as the desert rose. The way the piece is in dialogue with the other artworks is also impressive. The same themes of the passing of time and its effects on our environment are addressed here as is the dichotomy between the natural landscape and man-made impact. Talin Hazbar and La Manufacture Nationale de Sèvres. Transient: A Brief Stay, 2017 (detail). Image courtesy of Louvre Abu Dhabi. The final work in the show is Chromachron, 2017, a piece by Khalid Shafar that attempts to capture the essence of both time and colour. Shafar worked with Mobilier National Manufactures Nationales Gobelins-Beauvais-Savonnerie, the company that is responsible for furnishing the official buildings and presidential residences of the French Republic. Using the art of weaving, the collaborative effort created a tapestry of 144 colours where each line demarcates one hour of the annual cycle of the sun. The changes in chromatic hue and saturation of the material reflect the constantly altering intensity of the sun. Shafar’s recent practice is couched in the universal systems that guide us all and in particular, the passing of time. The triumph of this piece is its simultaneous power and fragility as well as the fact that the visually compelling work hangs from the ceiling in an almost complete loop so as to envelop the other three pieces. It is a fitting conclusion to the first exhibition at the Louvre Abu Dhabi that celebrates artists from the UAE. Co-Lab: Contemporary Art & Savoir-faire. December 21, 2017 - March 25, 2018. Forum, Louvre Abu Dhabi.